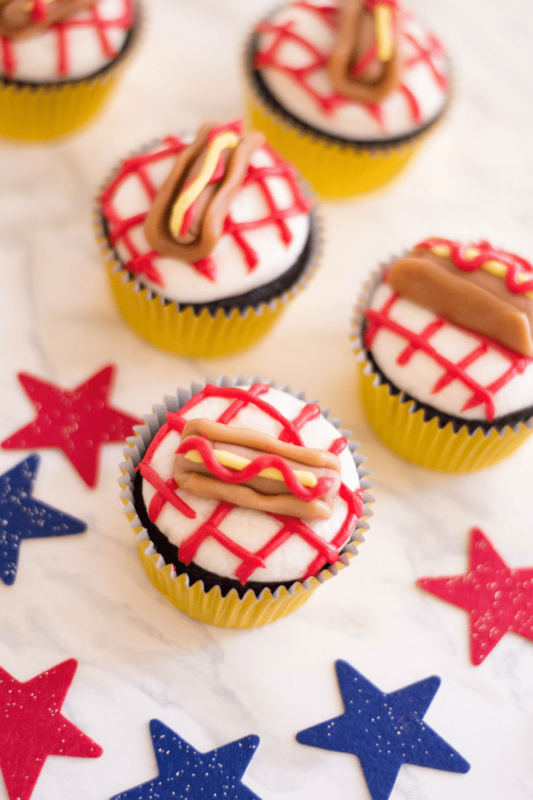 If you’re having a party for kids (or adults), try making these Hot Dog Cupcakes for dessert! They’re sure to catch everyone’s attention in the room. When we think of cupcakes, we always imagine the signature look: moist vanilla or chocolate cake topped with a creamy, fluffy swirl of icing on top with a lot of sprinkles. But nowadays, it’s become so easy to get creative with cupcakes that there are so many possibilities – even making them look like other food! 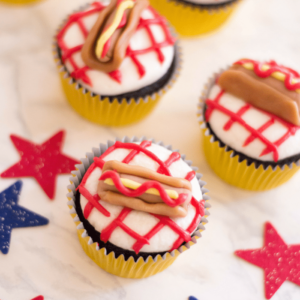 Everyone’s going to love these sweet Hot Dog Cupcakes! Mention it once to somebody who’s never heard of it before and they’ll probably imagine some weird recipe in their minds. 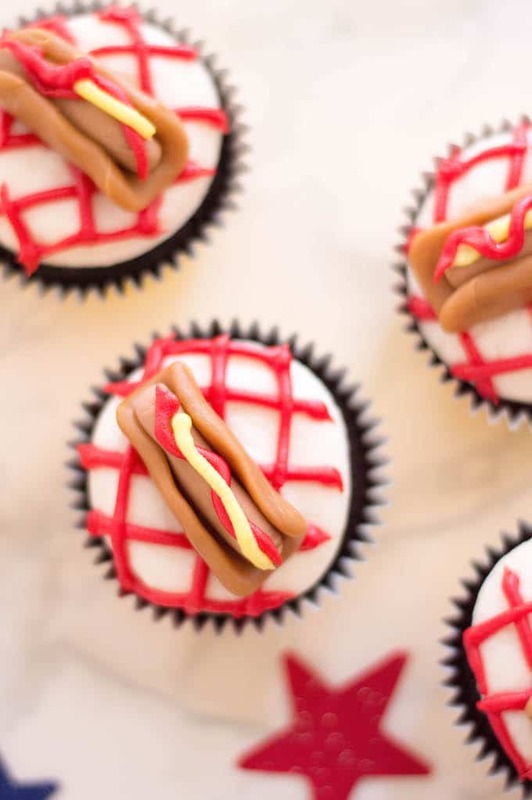 But when you give them one of these hot dog cupcakes, they’ll be glad to know that it is far from what they were imagining. These will look great on a 3-tier display at your next party! 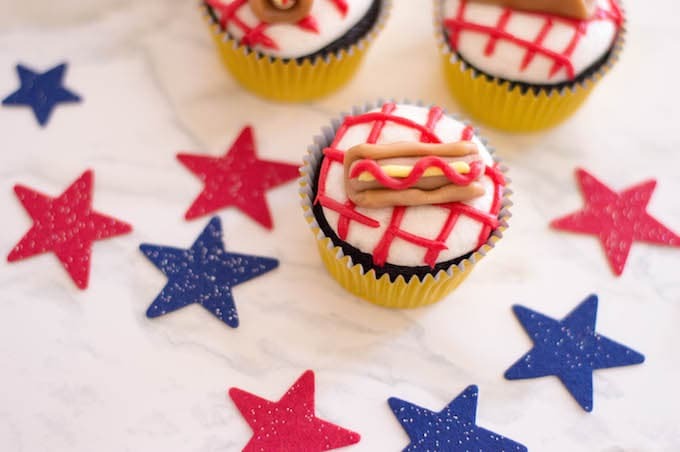 Your kids will love hanging out in the kitchen when you’re making these Hot Dog Cupcakes! This is one of those recipes that is fun to get your family involved in on a weekend. 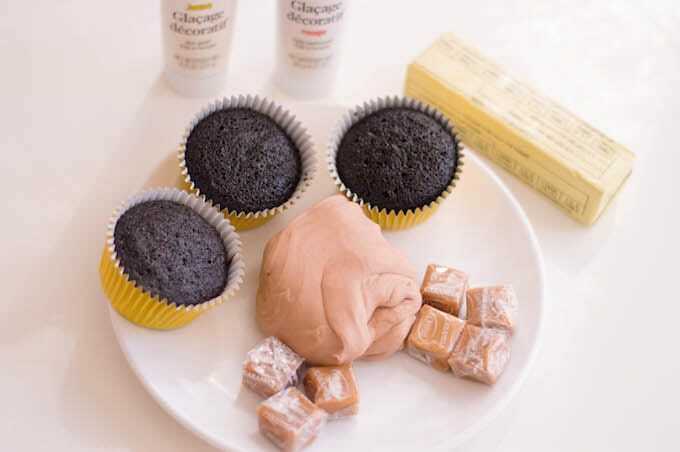 Like working with play dough, you can easily teach them how to mold the fondant to your desired shape and size. The biggest plus out of it is how proud they’ll feel after making a successful cupcake! Vanilla cupcakes are a tried and tested all-time favorite. It’s really hard to go wrong with this one especially if you have a specific recipe in mind! Caramel cubes are a gooey, salty and sweet surprise with the soft fondant! It adds more texture and flavor to the whole cupcake. The red and yellow frosting makes the cupcake look very inviting – like real mustard and ketchup! The colors just really grab your attention! Add more color and texture to your hot dogs by putting on some green and white sugar sprinkles to look like relish! It’s always nice to add a little more detail. If you don’t have caramel cubes, you can use two small cookie halves one either side of your fondant hot dog to look like buns. 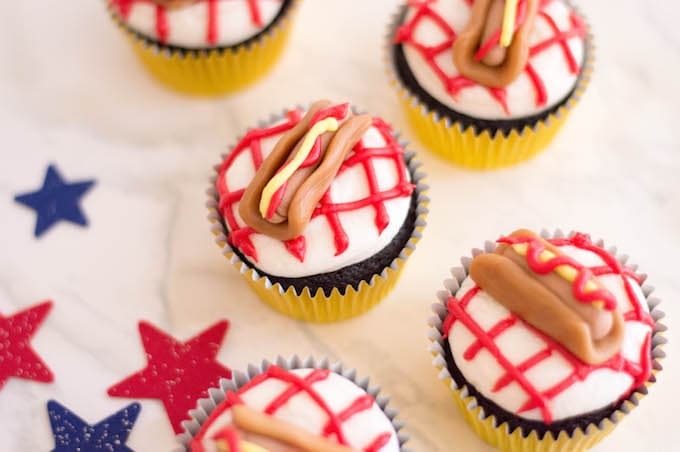 If you have black icing, use it to draw a grill on the cupcake and place red fondant hot dogs on it to make them look like they’re still being cooked. Add red and yellow sprinkles under the “grill” to make it look like crackling charcoal. Kids will find these details fun! Dot your cupcakes with red and yellow M&M’s to add more chocolate and crunch to your cupcakes. If you don’t have red icing, try putting on some strawberry jelly for the “ketchup”! It gives you more flavor and it makes it look more realistic too. 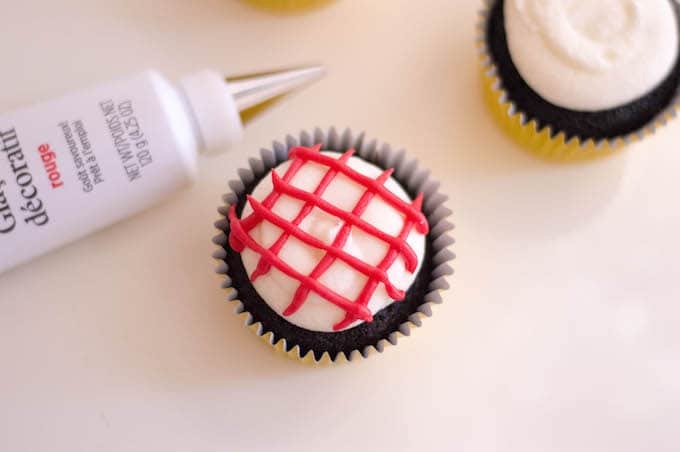 Make sure your cupcakes are completely cool before decorating them. Otherwise, your decorations and frostings will melt. If you want your kids to be involved in shaping the hot dogs and buns, give them an example to follow so that they can practice following instructions in the kitchen. Allow your cupcakes to cool completely before decorating. Start by preparing your buttercream: in a stand mixer, start beating sugar, butter, milk and vanilla extract on medium. Gradually increase to high. Beat until a semi-stiff consistency is formed. Ice each one of your cupcakes with a frosting bag. 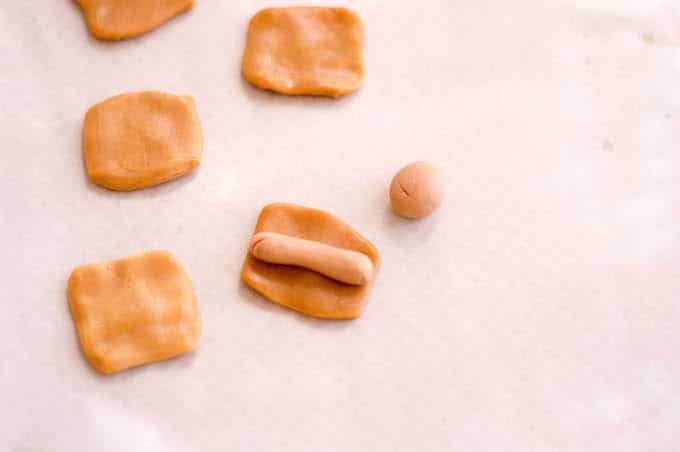 Place your fondant “hot dog” in the center of your flattened caramel candy and wrap. Decorate with red and yellow frosting (as ketchup and mustard) and place on top of each cupcake. 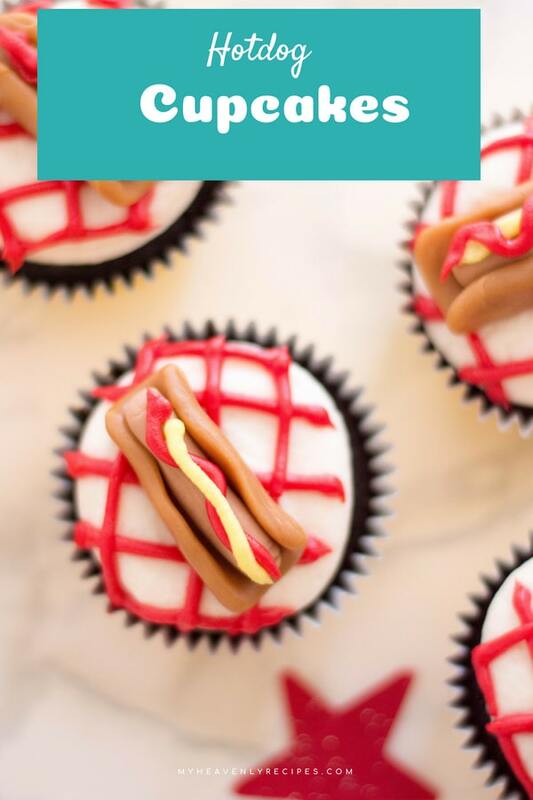 These hot dog cupcakes are great for birthday parties or as a game day treat. Line a baking sheet with wax paper and start rolling out your fondant into small ¼-inch spheres. Then, roll them into cylinders with rounded ends – these will be your “hot dogs”.